Aulus Vitellius was born in 15 AD, son of Lucius Vitellius, who was consul three times, and was the main adviser to Claudius. Aulus himself was named consul in 48 AD. He later embarked on a career in the military, and Galba named him commander in Lower Germany, which set the stage for his future political activities. Troops in Germany were not content with the treatment they were receiving under Galba, which led first to unrest and eventually to rebellion against him. Soon, Vitellius' generals hailed him as emperor, abandoning Galba's authority. His generals, Valens and Alienus took their troops to march on Rome in Vitellius' name. While on their march, it became known that Galba had been assasinated, and that another general, Otho, had been acclaimed as emperor it his place. Vitellius' troops continued their march, and engaged Otho's troops in the Battle of Bedriacum. Otho's troops were sorely defeated, and as a result, Otho took his own life. Vitellius adopted the title of Germanicus, not because of any military success, rather because it was in Germany that he was proclaimed emperor by his legions. This title was soon proclaimed on his coinage. 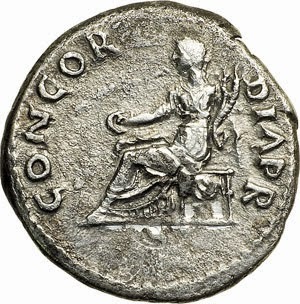 It is interesting to note that unlike previous emperors, he avoided taking the titles of "Caesar" and "Augustus", and as a result they were not used on some of his earliest coinage, even though he did later adopt them. With the void created by the death of Galba, yet a third general was proclaimed emperor by his troops. In the eastern part of the empire, troops proclaimed the governor of Judea, Vespasian, as their choice for emperor. Vespasian's troops began to march toward Rome. They engaged Vitelliius' forces near Cremona in the Second Battle of Bedriacum. Vitellius was in Rome at this point, and was unable to lead his army, and some of his generals were ill and also not able to command. This left the troops without an effective leader. Yet other generals, with mixed loyalties, abandoned Vitellius and supported Vespasian. Vespasian's forces defeated those of Vitellius, and continued to march to Rome. Vespasian's forces marched into Rome, headed by Antonius Primus, a general who was loyal to Otho against Vitellius. Forces loyal to Vitellius offered resistance, and fighting occurred in the city. During the battle, the temple of Jupiter was burned down. Vitellius took refuge in his palace, but was discovered, captured and slain. Much like his predecessor, Otho, Vitellius' numismatic contribution was limited by the brevity of his reign. 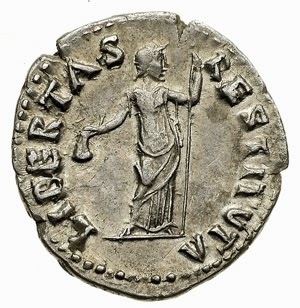 Silver coinage of Vitellius survives in the greatest numbers, with the reverses depicting Libertas Restituta and Concordia PR being the ones most often encountered. 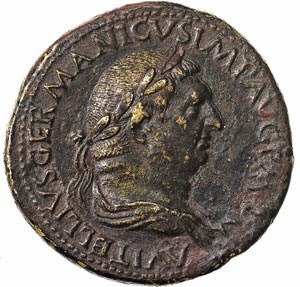 Bronze from Vitellius is scarce and highly desirable. Gold issued in his name is rare, and one of the most difficult to obtain of the Twelve Caesars. 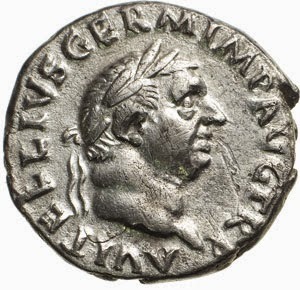 Portraiture on Vitellius' coinage varies in quality, and usually depicts him as a rough, massive figure. At its best, the artistry on his bronze issues maintains previously high standards.